I am being featured over at the Book Blogger's International today, for those interested in learning a little more about me. I do so little self-promotion anymore, admittedly, but I thought it would be fun to answer the survey questions. I have enjoyed getting to know other blogger's via the website, and the featured articles are always entertaining. I am not brave enough to write one of those. Last week I finished reading Ann Leary's The Good House. I had originally planned to listen to the audio version, but I wanted to finish the book for my book discussion. It takes me awhile to get through an audio book, so print--or rather e-copy--was my best option. I am excited about the discussion and hope my review will do justice to my thoughts about the book. 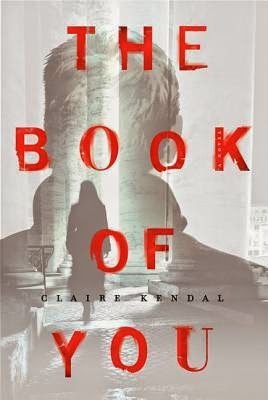 I am now reading Claire Kendal's The Book of You, which is described as an intense suspense novel about a woman believes she is being stalked. Perhaps it is not the best book to read before falling asleep at night, but when have I ever listened to that piece of advice? It is you. Of course it is you. Always it is you. Someone is catching up to me, and I turn and see you. I'd known it would be you, but I still lose my footing on the frozen snow. I stagger up. There are patches of wet on the knees of my stockings. My mittens are soaked through. I would definitely continue after that teaser. I'm reading a kids' book right now but it's just okay. Kathy - I finished the book this morning. It would have been last night, but Mouse was having trouble sleeping and I ended up falling asleep with her. Hopefully the book you are reading will get better--or be over quickly. Laurel-Rain - I hope you enjoy it as much as I did! I was so mad that I had to stop reading when I did last night. LOL It was the worst possible place. My husband had delayed long enough though. Yes I would continue reading. The more I read Suspense novels, the more I like them. Pat - I really like suspense novels. I get so involved in the good ones. I'm not sure about this one. It hasn't grabbed me yet. Kim - The intro didn't quite grab me right away either. Although knowing what the book was about helped spur me on initially. And it was such a good read once I got into it. Gautami - I think you'd like this one! The intro didn't really grab me, but I have heard good things about this book. I'll be interested to see what you think after you've finished. Sarah - My review will be going up next week. I finished this morning and need to formulate my thoughts onto paper/computer screen. I ended up really liking it though. I read this a couple of weeks ago on holiday, I thought it was really good, a page turner. I hope you enjoy it too! Lindsay - It definitely was a page turner, wasn't it? I just finished it this morning. I like the sound of this one and I've heard lots about it. I'm adding it to my wish list. Catherine - I hope you get a chance to read it, Catherine! Yes, I would continue to read it. I'm trying to remember. Have I ever read about a stalker? Tea - I read another stalking related book last year that was really good by Elizabeth Haynes, Into the Darkest Corner. The Book of You has been compared to it, and I can definitely see why. I admit I was worried they'd be too similar, but they were just different enough. I saw this book earlier put it directly on my TBR list. Nise' - Oh good! I hope you enjoy it when you read it. I was literally holding my breath a few times throughout the novel. I just finished The Perfume Collector by Kathleen Tessaro. It was a lovely book about two women, tracing their lives in 1928 and 1955 and how they finally interconnect. Since I just got back from Paris, it was wonderful to read a book set in Paris! Karen - It's good to hear from you! I have been hearing wonderful things about The Perfume Collector. It sounds like something I would enjoy. I hope you had a nice time in Paris. I like reading books set in places I've visited. Diane - It was a good one, and I hope you do decide to read it. I'd keep reading. This sounds good. Yvonne - I really liked it. The Book of You sounds interesting! And congrats on being featured, I'll stop on over. The Book of You was definitely interesting. I haven't had a lot of time to process the book fully, but I hope to get my review written soon. I love that opener and the way it is written. That totally engaged me. I'd like to read more. Margot - I hope you will give the book a try! I can't wait to start this one now! I was hoping it was going to be good :) I just need to finish my current read first! Samantha - I hope you like it. I will be curious to know what you think about the narrative style when you're done too. That's a very good teaser and of course I'll read more! I wouldn't be smitten either. Maybe it grows on one? Mystica - It definitely grew on me! I ended up really liking the book. Creepy! I would probably have to read more. Rachel - It was creepy! I can't even imagine what it must be like for someone to be in her position. The stalking laws, fortunately, are more firm than they once were and the crime is being taken more seriously, but there is still so much gray area that makes it difficult to prove and prosecute. Away over to Book Blogger International now. As I do most of my reading during the wee small hours this definitely sounds like the kind of book I'd have second thoughts about reading. Almost finished reading England Expects by Sara Sheridan whilst its an OK read for me there is just something missing. I'm sorry England Expects wasn't better for you. I haven't heard of that one. Great interview Wendy! It's always nice to learn more about my favorite bloggers! As for the book I'd definitely keep reading. It sounds kind of creepy which as you know I really love. It's a good book and I hope you get a chance to read it! The Book of You sounds too intense for me (though I'd probably keep reading if I managed to start it). I enjoyed learning more about you on Book Blogger's International. I had no idea you were a DOG and cat person! I am a cat person, though I'm sad to admit that I'm probably not giving my two cats the attention they deserve now that I have three kids. Sometimes I feel like there are too many little ones vying for my lap! A.M.B. - The Book of You definitely had its intense moments. I hope I am never in that situation, being stalked by someone. Scary! I know what you mean about feeling like you aren't able to give your cats the attention they deserve with kids around. I felt that way when we had the three animals plus the baby. It was hard to meet the demands of an infant/toddler with an equally demanding dog and two affection seeking cats. It still can be a challenge with just the two cats (although admittedly, it's easier now that we don't have the dog too--I hate to say it, but it's true even as much as I miss my Riley and having a dog in the house). Loved the interview! :) As I commented there, I especially enjoyed your comments on inscriptions. I do love the teaser, will mark this one for me. Peggy - I hope you do get a chance to read it--and like it if you do!